This album is a record of the music I wrote from 1972 to 1975. I was encouraged to produce and distribute the record on a national scale by my own needs as a lesbian musician and by the needs of lesbians who wanted and needed lesbian. My lover Tryna and I started out with a small distribution goal and only pressed 400 records. My concerts then, in 1975, were for wimmin only, and most of my audience was lesbians. I learned, however, that to passively 'allow' my concerts to be mostly lesbians was just not good enough. When I began to aggressively perform for lesbians ONLY I experienced just how true that was. The power and energy in the room were huge and uniquely beautiful. I began doing lesbian only concerts early in 1976. We continued the distribution to wimmin only. Now, Tryna and I can no longer distribute the album to straight women. All of the music and lyrics are for lesbians. In that paragraph "women" was spelled "wimmin". That was written in July of 1977 and she wrote this song for her lover, Tryna. That was called "for tryna". You mostly heard about lesbian separatism in the late 70s and early 80s and Linda Shear's album is the most vocal musical presentation of it I have seen. I don't know if Linda Shear has changed her viewpoint since 1977 but I do know she's still singing, as she appears on a various artists benefit CD called "High Risk." The double CD benefits the Lesbian Community Cancer Project in Chicago, and features mostly artists from that area. I think the CD is interesting because the first disc has mostly artists from the 80s like Ginni Clemmens and Paula Walowitz; and the other disc is very much up to date, with Patricia Barber, Ellen Rosner, a punk group called Three Dollar Bill, and many others. For this CD Linda Shear re-recorded one of her early songs. Here is "family of woman." That was Linda Shear singing "family of woman" from the benefit CD "High Risk". I want to mention a little more lesbian history. One of the very earliest homophile movement groups to be organized was the Daughters of Bilitis, in 1955 in San Francisco. They took their name from a book by French Poet Pierre Louys called "Songs of Bilitis," written in 1894. The book is a glorification of Sapphic love. 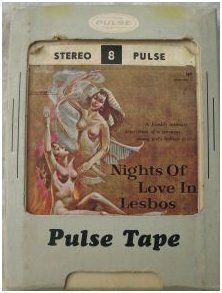 The reason I mention this is because I've found a very rare album called "Nights of Love In Lesbos." It's subtitled "a frankly intimate description of a sensuous young girl's lesbian desires." The album is readings from "Songs Of Bilitis" and I'm quite surprised that it was released in 1962. Here is a little bit from that album. Okay, back to the present. This year Tret Fure released a new album, called "Back Home," and it's gotten lots of critical acclaim. Many of you know about her very public 20-year relationship with Cris Williamson, which ended a couple of years ago. But you may not know that Tret Fure's career goes back to the early 70s, and she's a very respected woman in the music industry. In 1972 she did the then-unthinkable act of playing guitar on Spencer Davis' album "Mousetrap." It was indeed very rare for a woman to play guitar on a rock album. She released her own album in 1973 and it says something that she got guest support on it from such artists as Van Dyke Parks and Bonnie Raitt. Tret did not release her second album until 1984, this time on a division of Olivia Records. She spent the preceding 10 years learning the engineering end of the recording business and became well-respected in that area as well. During the 90s most of her releases were with Cris Williamson. Her new album is her first solo album in 11 years. I belong to an internet gay music discussion group called Outvoice, and it has a website where you can vote for your favorite albums and tracks, at www.outvoice.com. On the Outvoice charts, Tret's album "Back Home" has been #1 for the last 23 weeks. From it here is "bringing up the girl"
That was "bringing up the girl" by Tret Fure. In addition to this show, I'm also co-producer of a music segment called AudioFile that appears on This Way Out on this station and about a hundred others. Earlier this year we featured Tret's new album and got an interview from her. Here is a clip from that interview where she talks about her music, her break up with Cris Williamson and where she sees herself today. Hi, my name is Tret Fure and I have a new CD out called "Back Home." It's a CD that takes me back to my roots, the roots of folk music. It's the first acoustic CD I've done in 30 years and the first solo CD I've done in 11 years, and it really is a CD about coming home, coming back, ah it's a CD that actually is a journey about the last two years of my life, two years that have been a great struggle and a great change as I left a 20 year relationship with Cris Williamson, to strike out on my own, so there's a lot of depth to this CD I would say, there's a lot of struggle, as I've mentioned, and there's a lot of hope in it, and it's a CD that has come out of a difficult time, and it's a time I've gotten through, not so much on my own, but with the help of so many of my audience. My audience is primarily women, and I am a very out lesbian in that circle of women, and they have watched this transition, being a public figure, they have watched me leave a relationship that was actually a role model for a lot of women because Cris and I were happy and together for so long, and I've become something else now to those women, I'd say. I think for a lot of them I've shown that there, it takes a lot of courage to make change, but that change is the essence of our beings and that change is necessary and that if you are not happy you must make a change in your life. And making the change I have though it upset a tremendous population of women, ah, I think people have come around to the other side with us in this journey and have helped tremendously in offering encouragement and in offering a chance to be myself, to be who I am. But it wasn't easy, it was not an easy decision to make to personally and professionally leave a relationship that has held me safely for so long but it was a change that I had to make. And I thank my audience for helping me through that time, for encouraging me with email, letters, support in concerts, ah you know I think, I think we all face these decisions in our life, men and women, and it takes a great deal of courage, it takes a great deal of faith and I have that faith and I see it in others and that's a wonderful thing. You know, Cris and I were a singular entity for a long time so it was really hard to make that decision to go, but I needed to find my own music, I needed to find my own soul and I just want to thank all the audience who has helped me through this very difficult time. So this album really deals with all the changes in my life, all the changes in my love, all the changes in my heart. That was "this train" from Tret Fure's new album "Back Home." I want to go now to something quite different. Back in the early 70s David Bowie was in his Ziggy Stardust days and what we now think of as Glam Rock was probably at its peak. There was a promoter named Jerry Brandt who booked the Rolling Stones first American tour and who managed Carly Simon. He saw a chance to market the American answer to David Bowie when he discovered a singer named Bruce Wayne Campbell. Campbell had been performing in one of the first casts of "Hair" and in a local band, but had done little else. Brandt got him signed to Elektra Records, for the then-stupendous sum of $300,000 and the hype began. By this time Campbell was know as Jobriath. His first album, just called "Jobriath" at first received considerable praise, but his live show had some stumbling blocks. He was booked in January 1974 for the TV show "Midnight Special" but promoters panicked when they heard him rehearse his song "Take Me I'm Yours" with its line "I'm a slave to your perversity" and would only allow him to do a much tamer number. That, coupled with his being very out-he had announced "I'm a true fairy"-limited his radio exposure, and the marketing hype quickly lost its steam. From his first album here is the song he wasn't allowed to sing on "Midnight Special" "Take Me I'm Yours" followed by probably his most out lyrically song "I'm A Man." A second Jobriath album, called "Creatures of the Street" was released in the spring of 1974 but by then whatever momentum his career had was gone. In the late 70s he eked out an existence hustling on the streets of New York and singing in piano bars under the name Cole Berlin. He died of AIDS in 1983 at age 37. In the years that followed he acquired a bit of a cult following and artists like Morrissey and Neil Tennant of the Pet Shop Boys have voiced their respect for his work. It is of course difficult to say if Jobriath's career would have taken a different direction had the music industry then been more accepting of an openly gay rocker. Next up is a song by Thelma Houston. Most of you will know her from her huge disco hit "Don't Leave Me This Way," which reached #1 in 1976. But she also recorded a very gay song that year for the movie "Norman, Is That You." The movie starred Redd Foxx and Pearl Bailey and the premise was their finding out that their son was gay and dating a white man. Here is the movie's title song, called "One Out of Every Six." That was Thelma Houston singing "one out of six" from the movie "Norman, Is That You." In 1992 a lesbian group called Destiny released their cassette simply called "Destiny." I've played their music before on my show and think this release was excellent and did not get the exposure it deserved. The group was from Philadelphia and was made up of Mary Jo Paranzino, Mary Abt and Diana Bitting. From that album here is the song called "destiny." Singing lead on that song was Mary Jo Paranzino. I just love the power of her voice. I played that song for a reason. The group Destiny is no more but the two marys from that group are now part of a new group, called the Three Marys. When I heard about this group I couldn't wait to get the CD, because the group also contains a former member of one of my all time favorite gay groups, the Flirtations. Jon Arterton, one of that group's original members is now living in Provincetown and he is the third member of the Three Marys. From their debut album, called "The Three Marys" here is "all right okay you win"
In addition to being very pleased about this album, I'm also pleased that the group members gave me an interview, though I admit that they seem to be having such a good time that it's hard to get a word in. Hello, this is the Three Marys, Jon here, Mary Jo, Mary, and we are the Three Marys, Provincetown's favorite close harmony singing group, and now the world. And the name of our CD is The Three Marys, It's a CD with 11 cuts on it and I would say about half of them are political in one way or another. We're very out, Very out, we sing about our gayness, do we not, yes we do, we are gay, we are gay, but our audiences definitely do vary, from families to straight couples to gay and lesbian couples to bisexual people, transgendered, the audiences are definitely a great mix of the world, of the culture. How does the new group compare with your two former groups? but there actually aren't too many groups that have men and women performing together side by side and so really think and our fans tell us that that's a really powerful part of what we do. Mary Jo, I love your song "homophobic blues;" can you tell us about it. I wrote "homophobic blues" for my brother, Anthony, I had gone to tell my parents that I was a lesbian after being married for 8 years and I called a family meeting with my mom and dad and my brother Anthony and my sister-in-law grace. I called a family meeting and told them that I was a lesbian, and the result of it was that my brother called me when I got home and told me that I could never see his children again and, among other things, and so this song was inspired by that discussion with my brother, Anthony. Has there been a change of heart? Well, it's been a bunch of years cause the children born with mary and I being together, and they're in college now. My brother has actually come to the first concert to see the three marys and ah and he called me to tell me that he would like to get to know me and that he loves me and he came to the concert and heard this song and wants everybody to know that that was then and this is now and he's not an Archie Bunker and so I'm cautiously optimistic, so there you go, life's journey can sometimes be very fulfilling. I want to thank you all for tuning in to the show, and I especially want to thank the Three Marys and Tret Fure for the interviews. If you have questions or comments about any of the music I've featured, please email me . This is JD Doyle for Lesbian & Gay Voices on KPFT in Houston, and I'll be back on the 4th Monday of next month with another installment of Queer Music Heritage. .it was originally a Flirtations song and I love both versions. It's become somewhat of an anthem, and has been recorded by many gay & lesbian choruses. I'll let Jon Arterton introduce the song, "something inside so strong. We end a lot of our shows with the song "something inside so strong" which of course was a flirtations song, and it really comes out of the freedom movment in south africa, I guess we believe that the fight for civil rights that we are engaged in as gay and lesbian people is akin to other people's struggle for civil rights around the world.